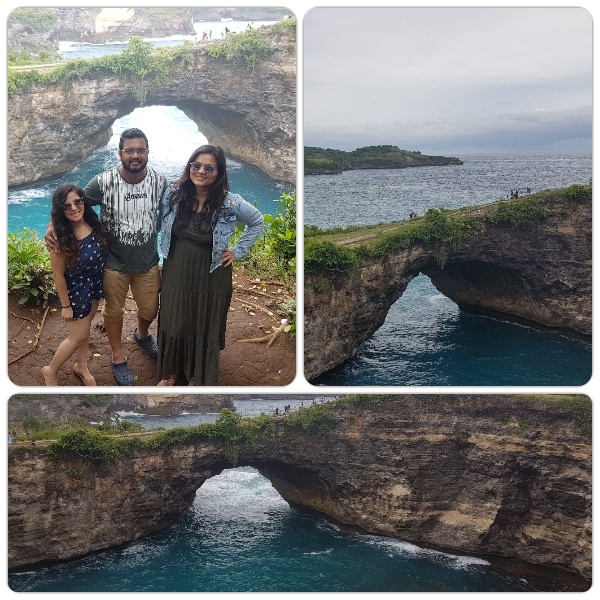 Out of eleven days of Bali Trip, we kept one-day for Nusa Penida Island tour. Situated on the south-eastern side of mainland Bali, Nusa Penida is a pretty new destination for tourists. Our driver in Nusa Penida even told that it’s been only a year since there are direct boats from Sanur Harbor to Nusa Penida. Previously, it was only accessible via Nusa Lembongan. As we were on tight schedule, we booked the tour to Nusa Penida from Bali via Klook. It included the hotel pick-up and drop off, two-way speed boat tickets, bottled water, and lunch. The per person cost of West Nusa Penida tour from Bali was USD 45. You can easily cover major tourist spots of Nusa Penida in a day. But if you are planning to go for various activities on Nusa Penida Island like scuba diving, etc., then I will recommend you to plan a 2-3 days trip. Bali’s Nusa Penida Island has become one of the most Instagrammed locations in recent times. Almost everyone, who goes to Bali, visits Nusa Penida and takes pictures at various beautiful locations of Nusa Penida. Nusa Penida Island is spread over 200 sq. km and is considerably larger than the very famous Nusa Lembongan and Nusa Cengian, which form the Nusa group of islands. Unlike Bali’s nightlife, beach clubs, noisy markets, and streets, Nusa Penida is pretty calm and peaceful with a lesser number of people. It doesn’t have many hotels and tourist infrastructures, which has left the nature in Nusa Penida untouched and unspoiled. Cleaner beaches and rarefied cultural highlights make this place a true Balinese experience. How To Reach Nusa Penida From Bali? Reaching Nusa Penida from Bali is quite easy; from Sanur Harbor being the easiest one. 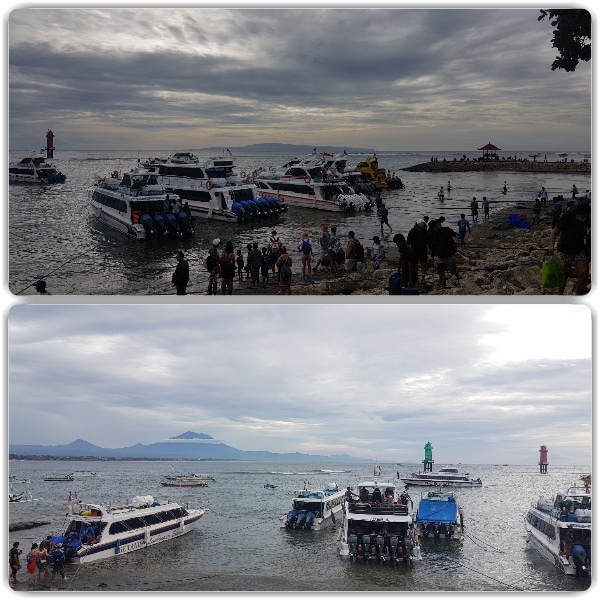 There are regular hourly speed boats from Sanur to Nusa Penida starting as early as 7.30 AM to 4.30 PM. 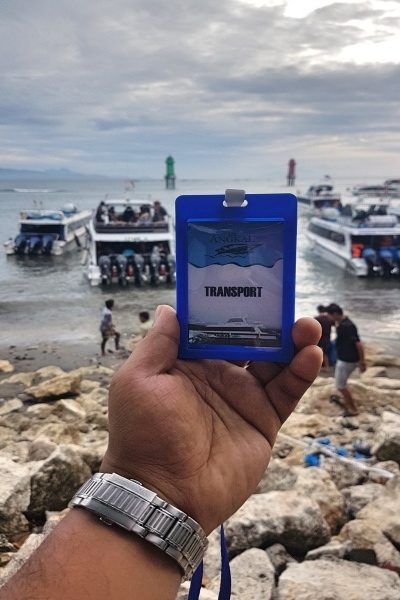 A few of many companies that provide ferry services between Bali and Nusa Penida include Idola Express, Angel Billabong Fast, Maruti, Mola Mola, The Angkal, and much more. Coming to the ticket prices for the journey from Sanur to Nusa Penida; if you’re an Indonesian it is around 200,000 IDR for a return ticket. However, for foreign tourists, the ticket costs around 300,000 IDR two-way depending on the ferry service you are taking. How To Book Ferry Tickets For Nusa Penida From Bali? There are various online platforms which let you book the ferry tickets for Nusa Penida from Bali. However, I will recommend that you go to the harbor and book tickets for yourself. Booking ferry tickets from Sanur Harbor is no rocket science. Once you reach Sanur Harbor, you can see counters of various ferry service providers. Just walk into the counter and get yourself a ticket by paying in cash. It is mandatory that you arrive at least half an hour before the ferry departure to get yourself a seat. After buying a ticket, you will get an ID card, which you have to keep until you board the ferry. It is like an identity of the company you are traveling with; primarily to filter out the crowd. You can explore the beautiful island of Nusa Penida on your own. As mentioned above, you just have to reach Sanur Harbor early in the morning – as early as 6.45 AM – and buy a ferry ticket to Nusa Penida. 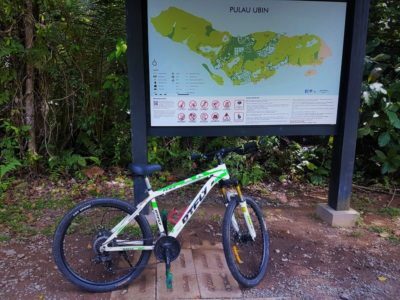 Upon arrival at Nusa Penida, book a two-wheeler rental and start exploring the island. Per day cost for two-wheeler rental at Nusa Penida will be 70,000 to 80,000 IDR, depending upon the type of vehicle. However, if you want a car for yourself, it might cost you around 600,000 IDR. 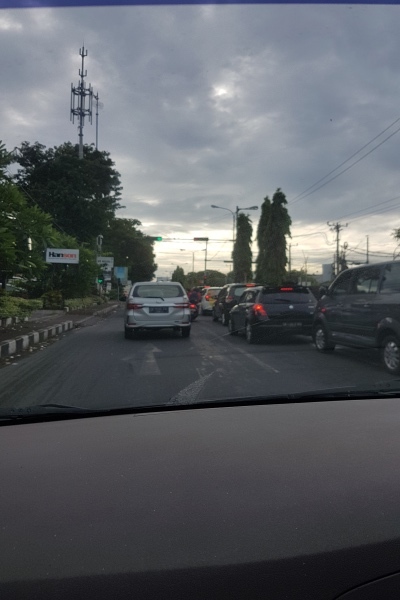 Roads in Nusa Penida are pretty bad and hence, I will recommend you to book a car, especially if you are in a group of 4-5 people. 1. Carry a lot of cash. There is a scarcity of ATMs on the Island and the majority of cafes, restaurants, and activities like snorkeling accept only cash. Therefore, carrying cash in excess can save you from trouble. 3. Download offline maps of Nusa Penida. If you are planning to explore Nusa Penida on your own, you cannot afford to miss this point. As mentioned above, there might be no internet in some places, which can be an obstacle for your navigation. Hence, download the offline maps and navigate smoothly on the island. 4. Carry 2L water bottles with you. It might get hot on the island and keeping you hydrated is important. Carry large water bottles from the mainland only as you can get a 2L water bottle for around 6500 IDR on the Bali mainland. On the other hand, if you buy a bottle in Nusa Penida, it might cost you around 20,000IDR for a 550mL water bottle. Yes! This is the price difference. 5. Carry a raincoat. This is totally optional. There might be unexpected rains on the island and unless you like getting drenched in the rains, carrying a raincoat is not a bad idea. 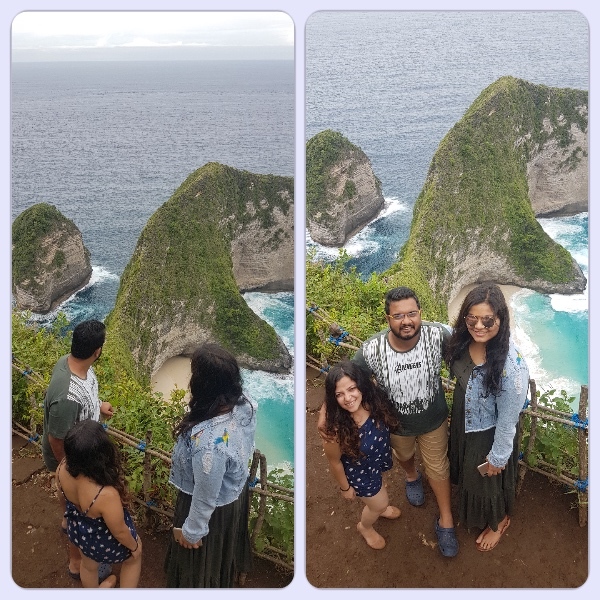 If you are on extremely tight schedule and do not want to go into all the hassles of booking tickets from Sanur, exploring Nusa Penida on your own then these tours are made for you. This is the tour, which I booked. 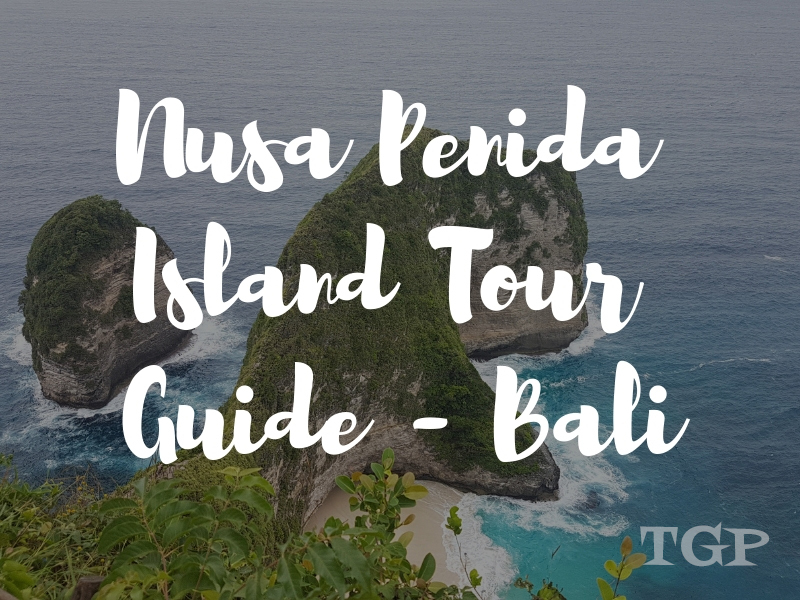 The West Nusa Penida Tour is one of the most famous ones and if you visiting Nusa Penida for the first time, I would recommend booking this one. West Nusa Penida Tour takes you to Kelinking Beach, Angel’s Billabong, Broken Beach, and Crystal Bay. The per person cost for this tour is between 720,000 IDR to 830,000 IDR, which depends upon your pickup point. Moreover, you can add snorkeling as an optional activity with this tour. Exploring the marine life of Nusa Penida is not a bad idea after all! A lesser number of visitors explore the eastern side of Nusa Penida. However, the lesser number means, better opportunity for Instagram photos. This side of Nusa Penida will take you to the beautiful Rumah Pohon Tree House, Atuh & Diamond Beach, and Teletubbies Hills. 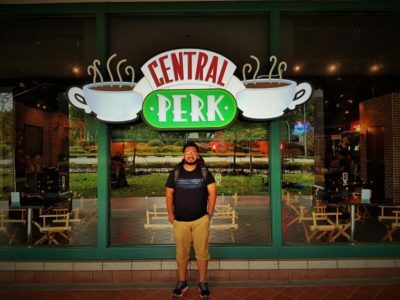 Per person cost for this tour is between 680,000 IDR to 770,000 IDR again depending upon your pickup locations. 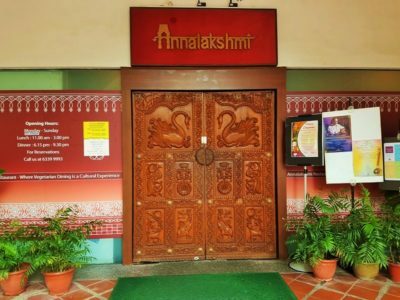 What’s Included In These Day Tours And Duration? The total duration of these tours is 8-hours, starting from your hotel pickup to drop off. 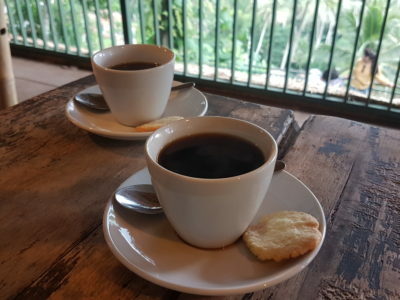 Both of the aforementioned tours are inclusive of hotel pickup & drop off; two-way speed boat tickets, transportation & English speaking guide in Nusa Penida, and lunch & bottled water. As I mentioned I booked West Nusa Penida Whole Day Trip in Bali from Klook, our pickup driver arrived at our hotel at around 7 AM, holding a placard with my name and KLOOK written on it. 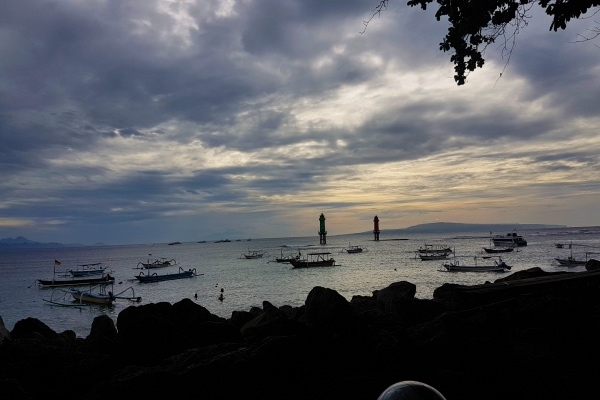 A beautiful 30-minutes early morning drive from our hotel took us to Sanur Harbour – the departure point for ferries to Nusa Penida. After walking a few hundred meters, we were at the ticket counters for ferries. Our driver bought the tickets for us and told us to wait for ferry departure. Ours was ‘The Angkal’ ferry service provider. As there were many other service providers, we were given an ID card to distinguish from other crowds. At around 9 AM, we boarded the ferry. The thing to note here is – there is no dedicated pier for boarding ferries. One has to go into the water and walk up to ferry to board the same. Hence, I will recommend you wearing flip flops during the boat ride. However, please do carry comfortable shoes too as Nusa Penida demands a lot of walking at a few of its tourist points. 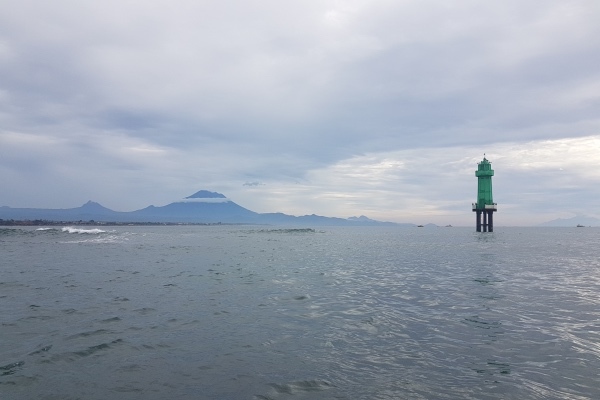 It was a beautiful 30-minutes fast boat ride between Sanur Harbour and Nusa Penida. During the journey, you can see the might Mount Agung on the left-hand side. Once we reached Nusa Penida, our driver was waiting for us with the car. Upon meeting, he gave us our water bottles and we were all set to explore the unspoiled natural beauty of Nusa Penida Island. As places to see in Nusa Penida are divided between western & eastern parts, we headed to explore Nusa Penida’s western part. The places, which we explored in West Nusa Penida were 1. Kelingking Beach, 2. Angel Billabong & Broken Beach, and 3. Crystal Bay. Our journey from Nusa Penida Harbour to Kelingking Beach was a mesmerizing one. 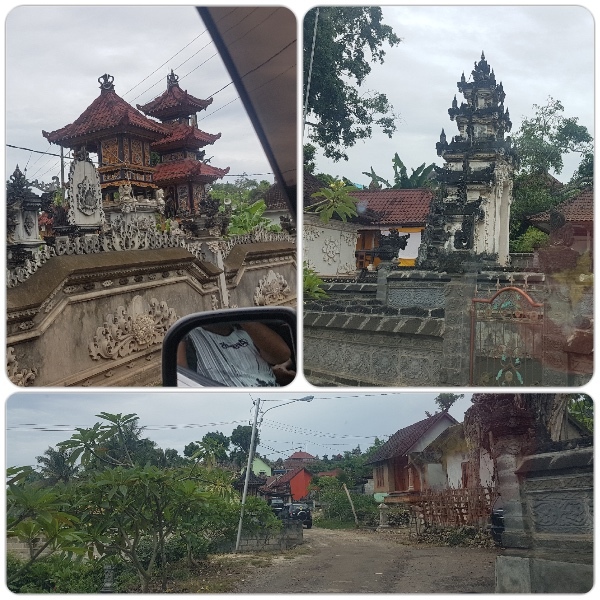 We passed through the authentic Balinese villages, boasting Balinese culture. The houses were also built in traditional Balinese architecture. The roads, though, were in pathetic condition. Only a few kilometers, in the beginning, were good but as we started going deep into Nusa Penida, roads were horrible. Our first stop was Kelinking Beach, one of the most Instagrammed beaches in the world. Discovered recently in 2003 by a group of tourist divers, Kelingking Beach gained popularity pretty early because of its natural beauty. 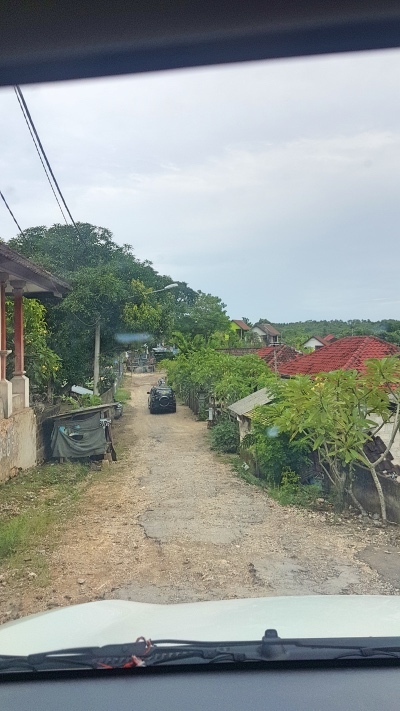 It was a 40-minutes drive from Nusa Penida Harbour to Kelingking Beach because the roads in Nusa Penida are narrow and uneven. Though the beach is a long way down via an extremely broken and uneven path. Getting down to the beach takes approximately 50-minutes and as I was on a booked tour, I had no time to go down and explore the beach. 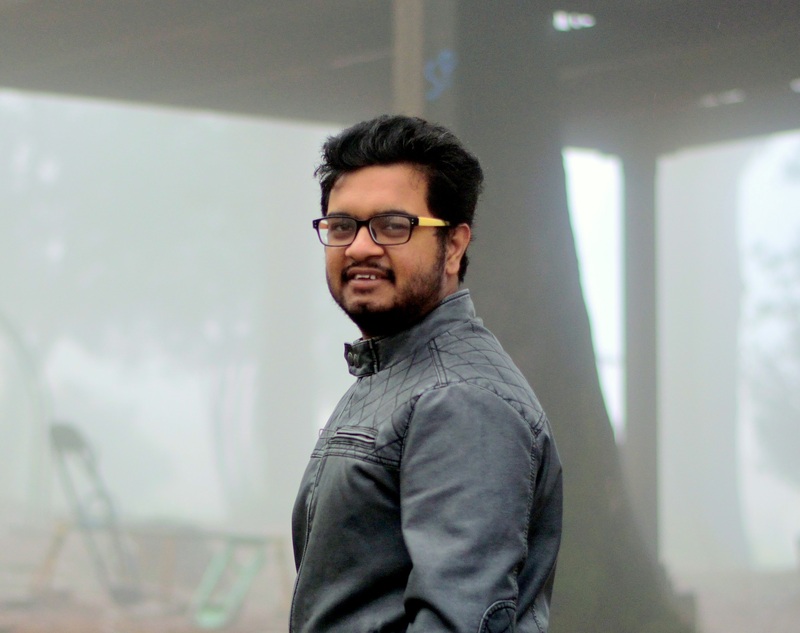 Our driver climbed on a small tree – which was a point to get the perfect photo – and clicked our amazing photos. 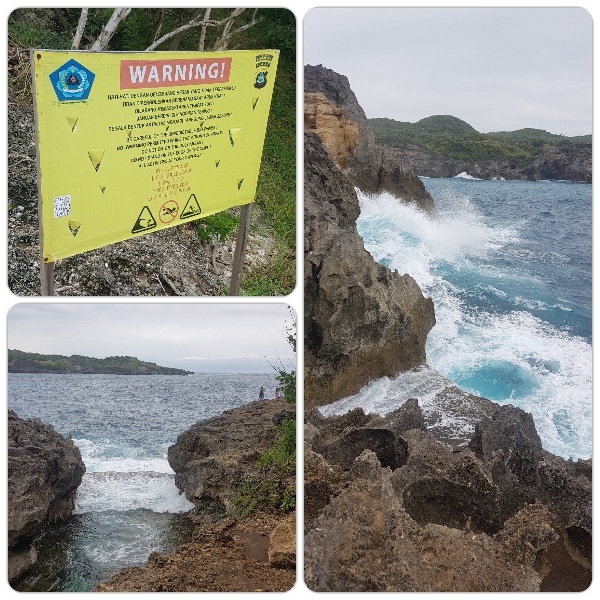 The next stop was Angel’s Billabong & Broken Beach. Again it was a drive of around 50-minutes to the location which are right next to each other. Angel’s Billabong consists of a rock pool, which opens directly to the ocean. The terrain here is rocky and uneven. Please be careful whilst walking here. Also, the waves crash like anything to this rock pool and hence, PLEASE listen to the locales if they tell you not to go to the very end. After a small photo session, we continued our walk to Borken Beach. Broken Beach is famous for its arch shape in a cliff, which allows water from the ocean and makes a pool. It was around 12.30 PM when we finished our Angel’s Billabong & Borken Beach exploration. Next was lunch. 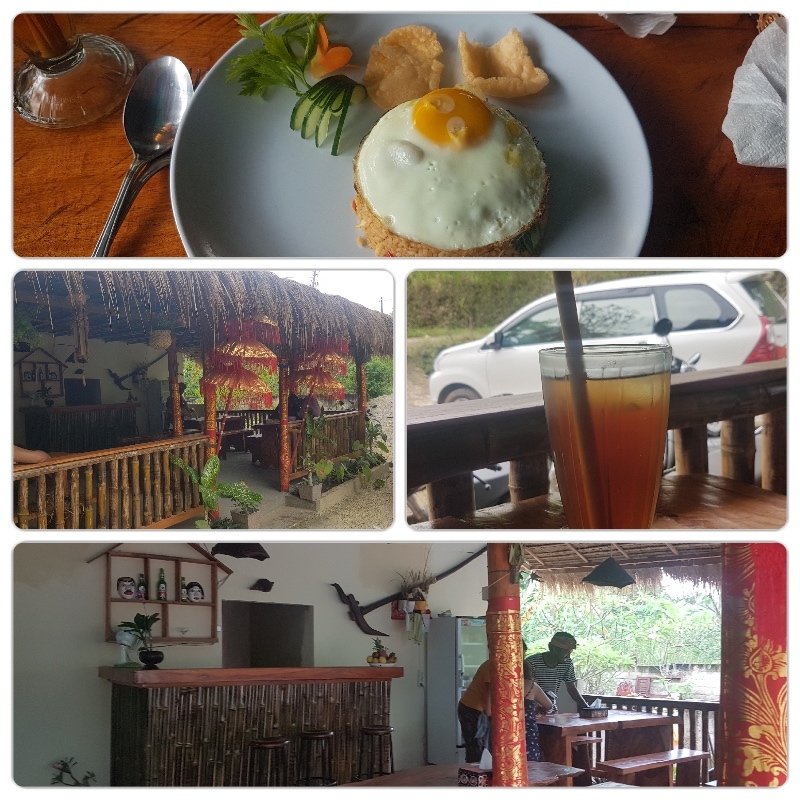 The tour we booked had lunch included and hence, our driver took us to a beautiful small authentic Balinese cafe. I ordered my most favorite Nasi Goreng – Balinese chicken fried rice and an ice tea. After having a delicious and fulfilling lunch, we continued our journey to our last stop of the day – Crystal Bay. After a hectic day, it was time to have a dose of the sea waves. To get this, we headed towards our last stop – the Crystal Bay. If you want to go for snorkeling in Nusa Penida or just want to swim at the beach, Crystal Bay is the place to go. Crystal Bay is extremely beautiful. Clear blue waters, clean beach, and the therapeutic sound of waves – the trip to Crystal Bay was an amazing one. As we were on tight schedule, after 30-minutes it was time to say goodbye to Crystal Bay. It was already 3 PM when we left Crystal Bay and our ferry departure time was 4.30 PM. It is mandatory that you arrive at least 30-minutes prior to the departure time as there are limited seats. Hence, if you miss the ferry, you have to wait for another one to come. 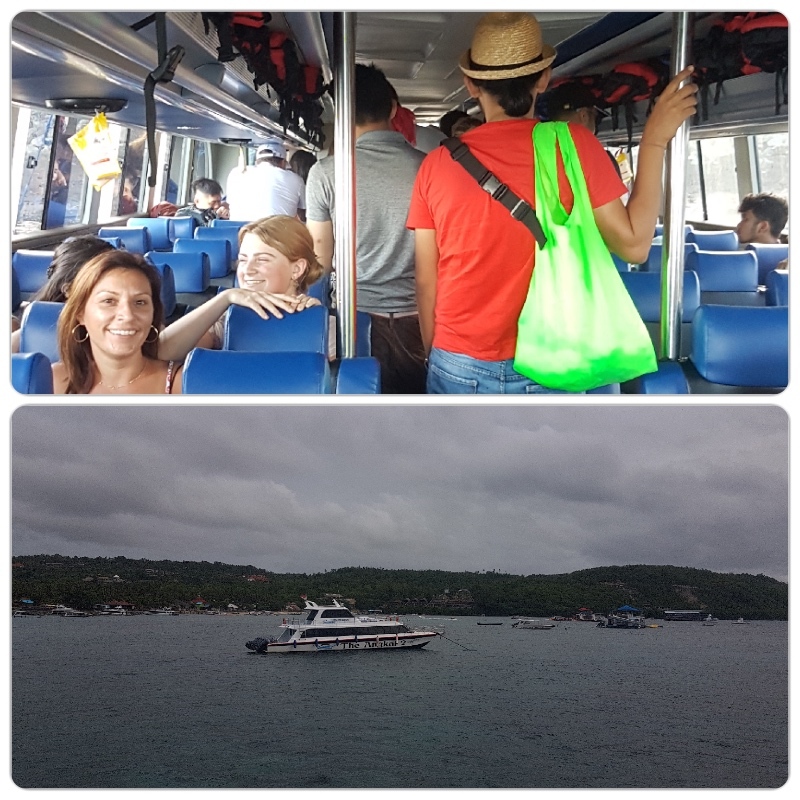 Again the traveling time from Nusa Penida to Sanur Harbour is 30-minutes. 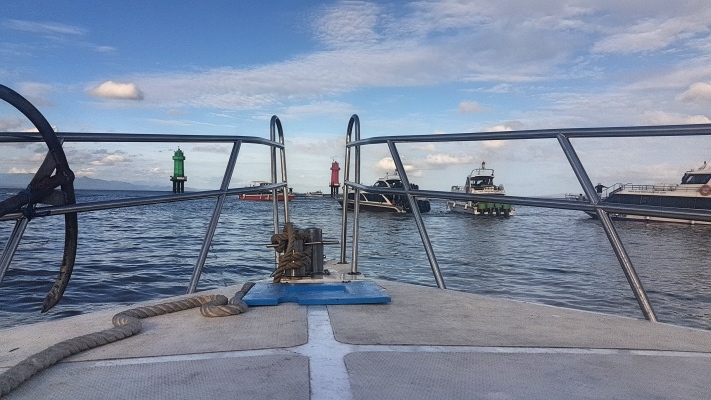 We reached Sanur Harbour at around 5.05 PM where we met our driver who dropped us to our hotel. 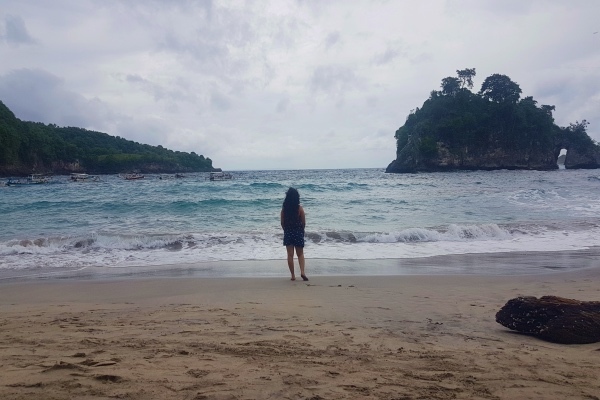 So, this was my journey to the beautiful Nusa Penida Island in Bali.